"Monitoring is one open and transparent way of guaranteeing that the money that came from the BP fines was well spent," Dr. John Valentine, Executive Director of the Dauphin Island Sea Lab, said. The Natural Resource Damage Assessment Trustee Council, the Gulf Coast Ecosystem Restoration Council, and the National Fish and Wildlife Foundation are the largest restoration programs working towards the Gulf of Mexico's recovery after the 2010 spill. 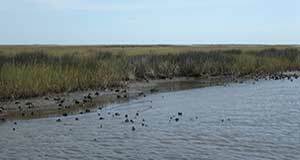 These programs oversee projects that range from coastal and offshore habitat restoration to recovery of certain species, water quality improvement and land acquisition. However, monitoring of these projects has been dramatically underfunded according to the report. "One frustration we've had is we've been talking about monitoring since 2010 and it still gets no traction anywhere," Dr. Valentine said. "Monitoring data can be used to develop adaptive strategies that would guarantee we are wise stewards of Alabama's remarkable biological diversity for both our children and our children's children." The report provides more specific restoration monitoring guidelines for 6 habitats and species groups in the Gulf of Mexico. To read more on the report, visit www.nationalacademies.org.